ReadContainers and WriteContainers form an abstraction level that allow you to define which data is displayed or where it is written on pages of an application. Data is reads with ReadContainers and written with WriteContainers. 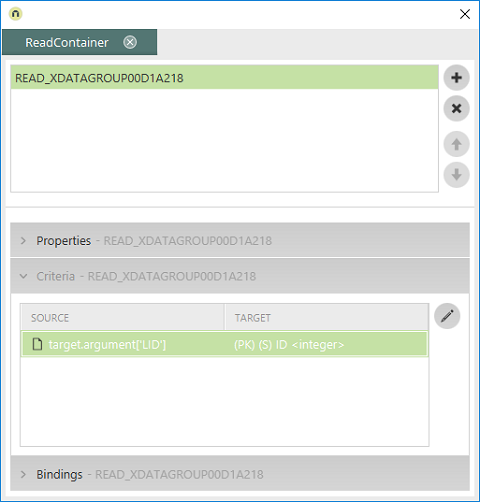 With ReadContainers, data from the data group, which contains the current applications page, is read. 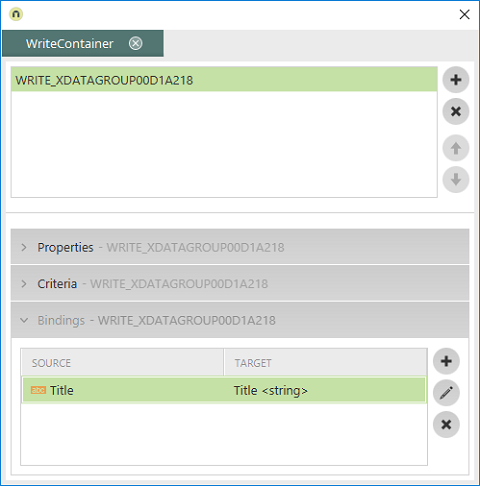 With WriteContainers, data can be written to any data group of the same application. You can also use custom ReadContainers and WriteContainers to integrate custom Java classes. 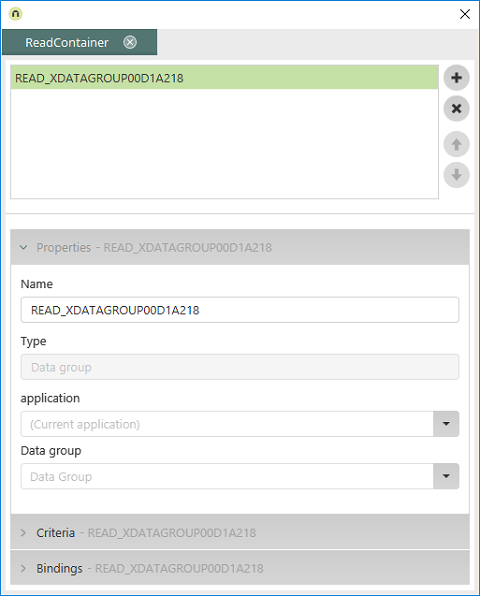 Every application page has exactly one ReadContainer for the data group, which it is contained in. View pages at the top level of the application structure (i.e. directly beneath the application node) and pages in a system data group are exceptions to this. These pages do not have a ReadContainer and one cannot be created for them. In addition to the predefined ReadContainer on application pages in a data group, custom ReadContainers can be created that enable you to integrate custom Java classes. Opens a dialog where a new ReadContainer can be created. Deletes the currently selected ReadContainer. Change the order of the containers. For every free layout table on a page, exactly one ReadContainer is created with the "multiInput" type. Beneath the list of ReadContainers, you will find the properties of the ReadContainer currently selected. You can show/hide these by clicking on the title bar. Displays the name of the ReadContainer. The dataGroup type is used for the standard ReadContainer, which is automatically created for every application page in a data group. The name of these ReadContainers is made up of the prefix "READ_" and the name of the respective data group. In principle, the dataGroup Type is used for ReadContainers that provide data from a data group. This type is used for free layout table that the current page contains. This ReadContainer is also created automatically when you create a free layout table. The name of these ReadContainers is made up of the prefix "READ_" and the GUID of the respective free layout table. This type is used for ReadContainers that integrate custom Java classes. 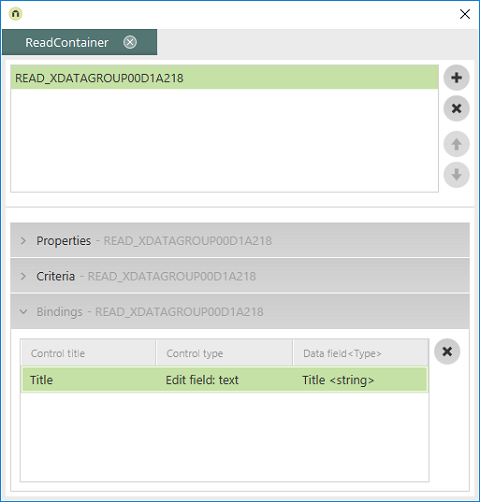 Displays the application and data group whose data is read by the ReadContainer. Beneath the properties you will find the filter criteria of the ReadContainer currently selected. You can show/hide this area by clicking on the title bar if the type is "dataGroup" or "userdefined". For "dataGroup" ReadContainers, these are usually already predefined correctly. The filter criteria inform the page which data record is to be displayed. The data restriction using filter criteria corresponds to the WHERE clause in the SELECT statement in the database request. As a page in a data group should only show one single data record, every possible combination of source and target values cannot be selected when editing the filter criteria. This means that a request cannot return more than one data record, which would cause an error when loading the page. The filter criteria are deactivated for "multiInput" ReadContainers as the data displayed in the free layout table is controlled by the pages it integrates. Displays the source of the filter criteria. The source corresponds to the value that should be used to filter the data in the data group. Displays the target that the value defined in the source is compared to. If these match, the corresponding data record is displayed. Displays a page where the filter criterion can be edited. The help for the settings on this page can be accessed by clicking on the question mark symbol. Bindings link the data read via the ReadContainer to the application elements on the page. Every element that has a binding is displayed in this list. The title of the element is shown here. The control type of the element is shown here. Displays the data type of the data field linked to the element. Deletes the binding currently selected. 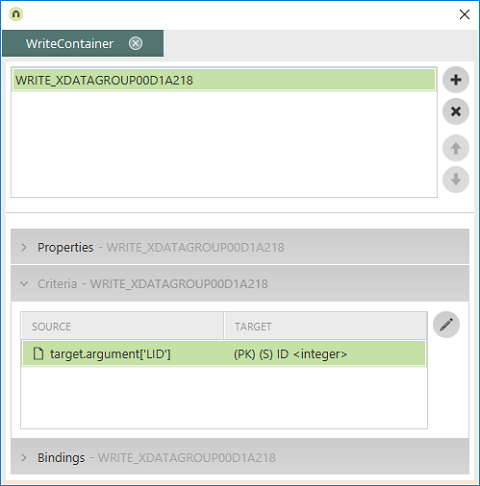 Every application page automatically has a WriteContainer for the data group, which it is contained in. 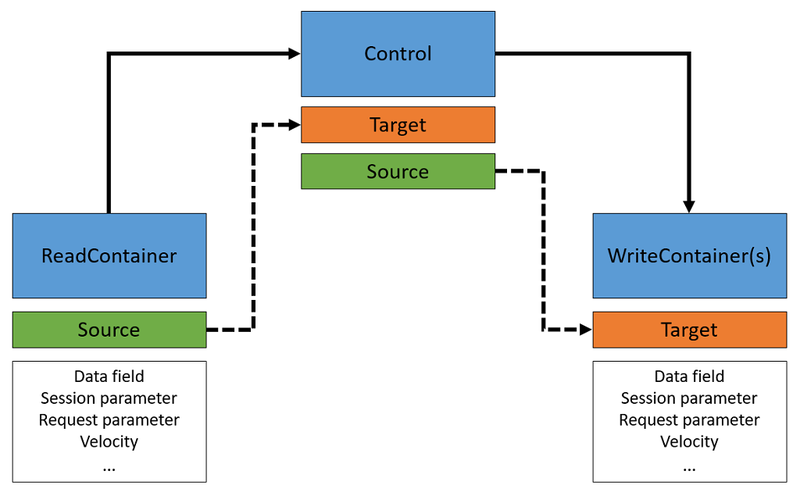 WriteContainers can be created on all pages except for View pages at the top level of the application structure (i.e. directly beneath the application node). Without a WriteContainer, the data record cannot be deleted. Opens a dialog where a new WriteContainer can be created. Deletes the currently selected WriteContainer. For every free layout table on a page, exactly one WriteContainer is created with the "multiInput" type. The properties of WriteContainers correspond to those of ReadContainers. 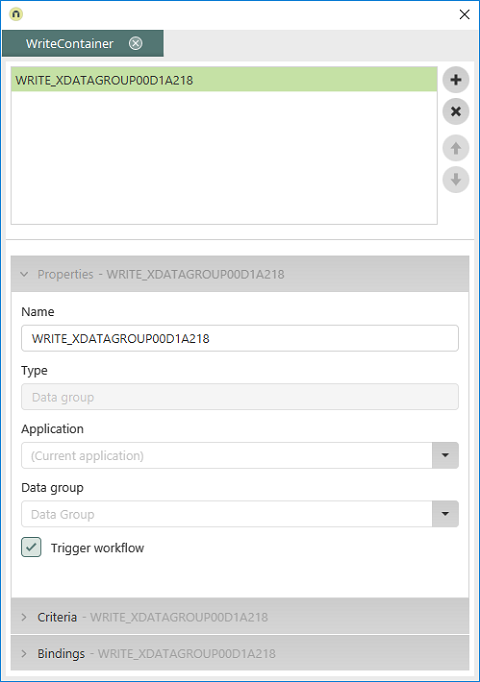 This additional setting means that a data group event handler, which listens to the same data group, is triggered in a process, as soon as a Save button is clicked on on the page that contains the WriteContainer - meaning the data record is saved. If this setting is not activated, the event handler will not respond and the subsequent process steps will not be triggered. This is useful when constructing wizards that lead the users through multiple edit pages in the browser, for example. By activating the "Trigger workflow" setting, you can control that the event handler is only triggered when the Save button on the last page of the wizard is clicked on. Beneath the properties you will find the filter criteria of the WriteContainer currently selected. You can show/hide this area by clicking on the title bar if the type is "dataGroup" or "userdefined". 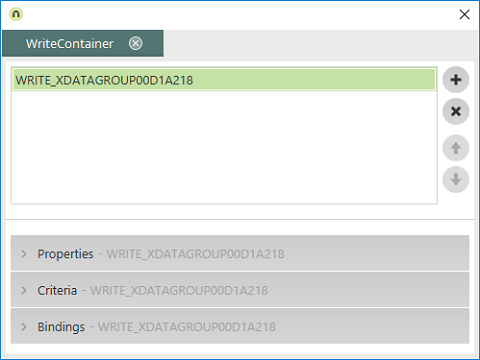 For "dataGroup" WriteContainers, these are usually already predefined correctly. The filter criteria inform the page which data record is to be saved. The data restriction using filter criteria corresponds to the WHERE clause in the UPDATE statement in the database request. As a page in a data group should only save one single data record, every possible combination of source and target values cannot be selected when editing the filter criteria. This means that a request cannot edit more than one data record, which would cause an error when saving the page. 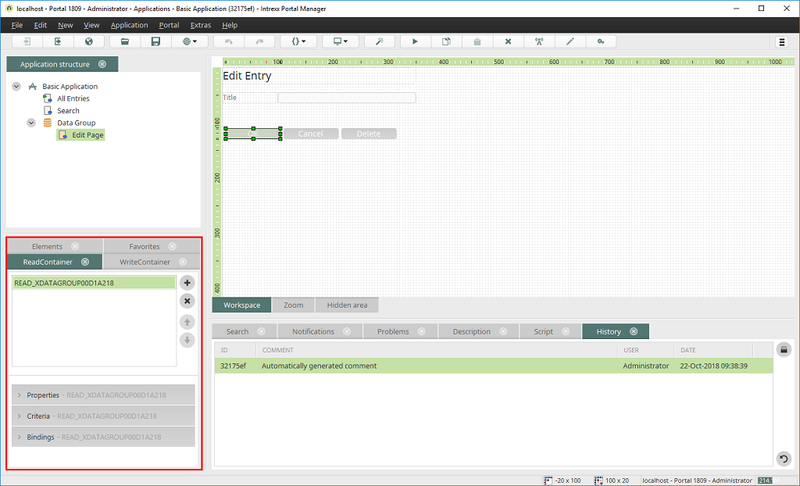 The filter criteria are deactivated for "multiInput" WriteContainers as the data saved in the free layout table is controlled by the pages it integrates. Displays the target that the value defined in the source is compared to. If these match, the corresponding data record is used for saving the data. Application elements, which have a binding, can be added or edited here. Elements can also be dragged from the workspace to the Bindings area via drag & drop. Displays a page where a new binding can be created. The help for the settings on this page can be accessed by clicking on the question mark symbol. Displays a page where the binding currently selected can be edited. The help for the settings on this page can be accessed by clicking on the question mark symbol.